Remember that this website cannot provide you with everything you need to know to be a storm spotter. This is only an introduction to storm spotting and is very general in nature. If you want to learn more about the meteorology behind storm observations, you should attend a NWS storm spotter training session<. These are typically offered during the late winter and early spring and include much more detailed information on storm types, visual clues for severe weather, spotter safety and procedures and severe weather meteorology. Thunderstorms are common in this part of the world, and most of us are quite familiar with them and the dangerous weather they can bring. Most individual thunderstorms only last several minutes, however some individual thunderstorms become very well-organized and can last several hours. These long-lived thunderstorms are called supercell thunderstorms. Supercell thunderstorms are responsible for the majority of significant severe weather, including very large hail and tornadoes. However, storms that form in organized lines (called squall lines) can also produce widespread strong and damaging winds. The National Weather Service issues severe thunderstorm warnings and tornado warnings, based in part on observations from storm spotters in the field. Your reports are important to warning forecasters who are making critical warning decisions. 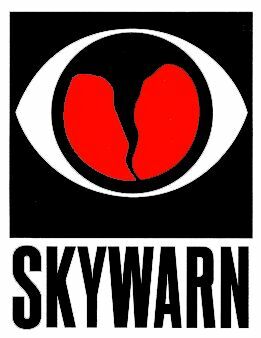 Storm spotters play a vital role in the warning and information process by observing storms and making reports back to the National Weather Service and local public safety officials. Trained spotters learn about the physical structure of severe storms and how to identify the most likely areas for severe weather development. They also learn about visual clues that may precede tornado development, and learn to distinguish between real tornadoes and look-alikes at www.stormeyes.org. These types of details, when coupled with NWS forecasters’ expert radar interpretation, lead to better warnings and statements. A violently rotating column of air in contact with the ground and extending from the base of a thunderstorm. A visible funnel does not need to reach to the ground for a tornado to be present; a debris cloud beneath a thunderstorm is all that is needed to confirm the presence of a tornado. Tornadoes can assume a wide variety of shapes, sizes and colors depending on your viewing angle and many other factors. A funnel extending from the base of a cloud, associated with a rotating column of air that is not in contact with the ground (and hence different from a tornado). A funnel cloud in itself is not dangerous, but provides a clue that a tornado could form very quickly. A localized, persistent, often abrupt lowering from the base of a thunderstorm. Spotters should know that not all wall clouds produce tornadoes!! Wall clouds can range from a fraction of a mile up to nearly five miles in diameter, and normally are found on the south or southwest side of a supercell thunderstorm. When seen from within several miles, dangerous wall clouds show rapid upward motion and cyclonic rotation. However, not all wall clouds rotate. Rotating wall clouds usually precede significant tornadoes, by anywhere from a few minutes up to nearly an hour. Wall clouds should be watched closely for signs of persistent, sustained rotation and/or rapid vertical motion. A dark, horizontal cloud base with no visible precipitation beneath it. The rain-free base typically marks the location of the thunderstorm updraft. Tornadoes may develop from wall clouds attached to the rain-free base, or from the rain-free base itself - especially when the rain-free base is on the south or southwest side of the main precipitation area. Note that the rain-free base may not actually be rain free; hail or large rain drops may be falling. For this reason, updraft base is more accurate. A significant severe thunderstorm with a persistent rotating updraft. Supercells are relatively rare, but are responsible for a remarkably high percentage of severe weather events, including tornadoes, extremely large hail and damaging straight-line winds. On radar, a supercell may have a hook echo and may show strong rotation. A strong downdraft resulting in an outward burst of damaging winds at or near the ground. Downburst winds can produce damage equal to that of a strong tornado. Downbursts are usually associated with thunderstorms, but can also occur with showers too weak to produce thunder. To see a more extensive glossary of spotter terms, please read NOAA Technical Memorandum NWS SR-145, A Comprehensive Glossary of Weather Terms for Storm Spotters, by NWS Norman Lead Forecaster Mike Branick. Spotters provide an invaluable service to their communities and to the National Weather Service. Flooding that impacts roads, homes or businesses. Again, reports should provide as much detail as possible to describe the where, when, how, etc of the event. Whole trees in motion. Inconvenient walking into the wind. Light-weight loose objects (e.g., lawn furniture) tossed or toppled. Large trees bend; twigs, small limbs break and a few larger dead or weak branches may break. Old/weak structures (e.g., sheds, barns) may sustain minor damage (roof, doors). Buildings partially under construction may be damaged. A few loose shingles removed from houses. Large limbs break; shallow rooted trees pushed over. Semi-trucks overturned. More significant damage to old/weak structures. Shingles, awnings removed from houses; damage to chimneys and antennas. Widespread damage to trees with large limbs down or trees broken/uprooted. Mobile homes may be pushed off foundation or overturned. Roof may be partially peeled off industrial/commercial/ warehouse buildings. Some minor roof damage to homes. Weak structures (e.g., farm buildings, airplane hangars) may be severely damaged. Many large trees broken and uprooted. Mobile homes damaged. Roofs partially peeled off homes and buildings. Moving automobiles pushed off the road. Barns, sheds demolished. WHERE did you see it? Report the location/approximate location of the event. Be sure to distinguish clearly between where you are and where the event is thought to be happening (“I’m 5 miles north of Mayberry. The tornado looks to be about 5 miles to my northwest”). WHEN did you see it? Be sure that reports that are relayed through multiple sources carry the time of the event, NOT the report time. Any other details that are important - How long did it last? Direction of travel? Was there damage? etc. | Site Map | Contact Us | © 2005 THE SAM HOUSTON AMATEUR RADIO KLUB .